Once again, great job. I'd always wondered why the old factory had the top floors removed. 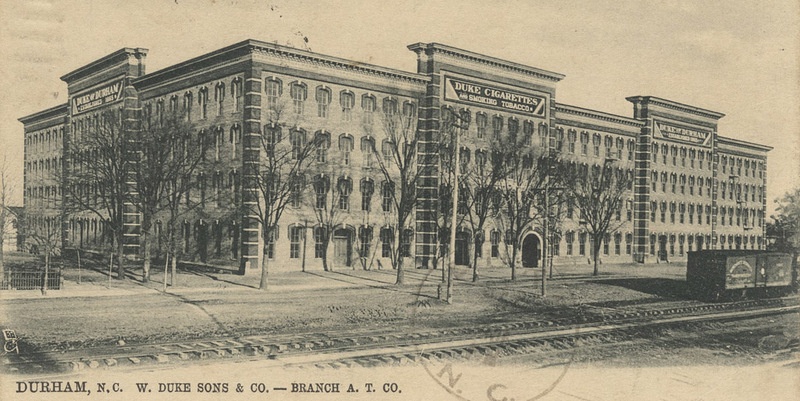 I notice from old postcards that the same was done to the Old Bull Building at American Tobacco. Same reasons? Thanks Dan. You're right about the eastern half of the Bull building at American tobacco - for others, the entire building used to be the 4-story height that the western portion still is. I don't have any better insight into the reasons - several different people have told me that reducing the height below some level allowed for substantial fire insurance savings (and I suppose utilities, etc.) It really seems like a pretty drastic measure, though, and likely an expensive one, so I don't know if there was another motivation that I'm unaware of. I've also heard that the weight of new cigarette machines were too heavy for the structure, and had damaged the top of the building. one of those stories we'll never hear. Thanks for the info - I've never heard that before. It does seem like there are more than a few structures that had their top few floors removed, and I'd be curious to figure out what the motivation was. I have no documentation to back this story up. It was told to me in the 1970's on a tour of L&M: The old building was to be demolished to expand the new Chesterfield factory to the west. He pointed out the off-center doorway on the Chesterfield building. The old building was dismantled from the top, but due to a downturn/different focus of the industry, the deconstruction was stopped and plans were halted, the building was returned to service. 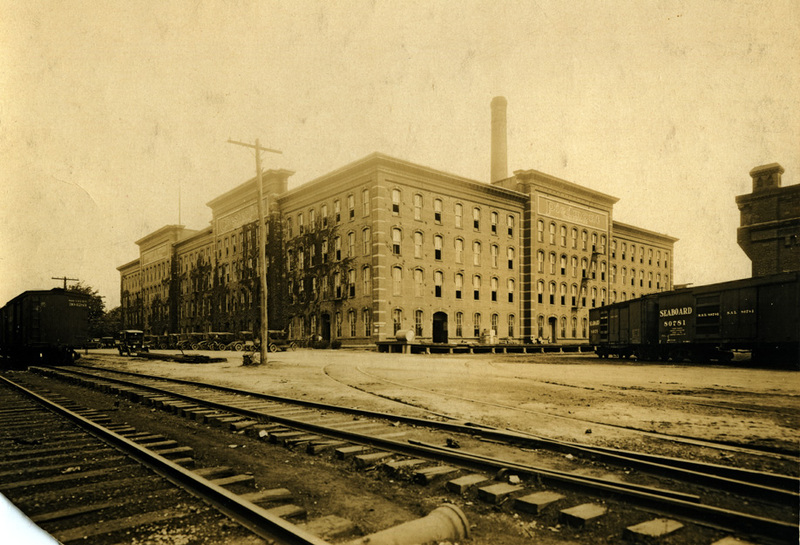 The Duke Cigarette Factory was built in 1884 to replace the wooden structure that Washington Duke constructed just to the west of the site in 1874. The original wood frame tobacco factory. 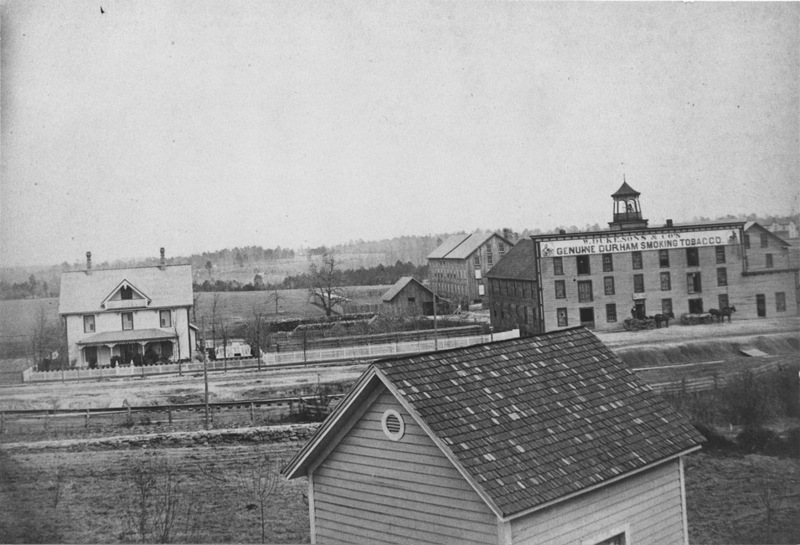 Taken from approximately present-day West Chapel Hill Street (west of the railroad tracks) looking north. Washington Duke's original house is on the left. The replacement building was originaly a 4-story, brick, Italianate structure, with main facades fronting the railroad tracks (south) and facing east. This somewhat unusual picture shows the brick factory, the old factory, the original Washington Duke House, and Fairview. 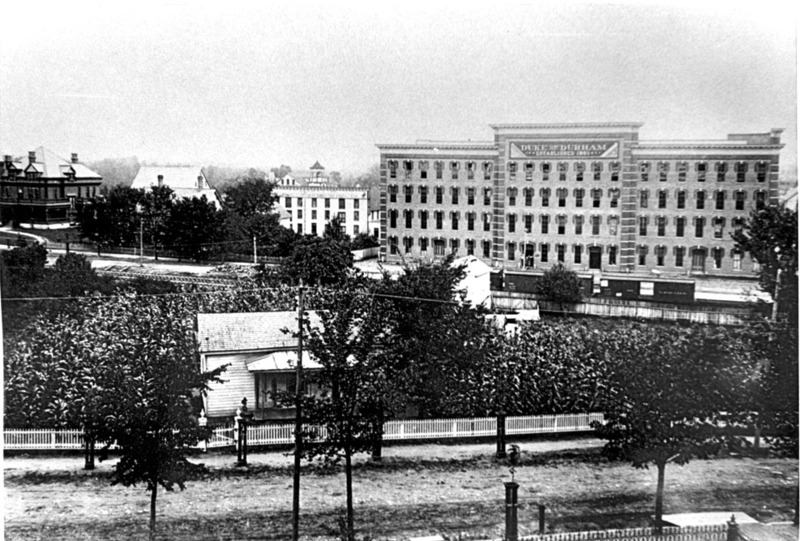 By 1893, the original factory and Washington Duke's original house were torn down to expand the factory to the west, transforming the original building into a three sided structure with wings facing west and east. The above picture was taken looking northwest from the approximate location of today's Amtrak station. The edge of the Walker warehouse is on the right. This picture is from 1901, looking north. The factory is in bunting for President McKinley's death. This picture is taken from the other side, looking southeast. The photographer is standing on the parcel of land at the northeast corner of Duke and Main Sts. The office building, to the west (right) of the factory in this picture was moved across the street during the 1940s prior to construction of the New Cigarette Factory (big blocky building with black lines). An aerial shot howing the full structure in the 1920s. Taken from the current site of the New Cigarette Factory , looking northeast, with the main factory building to the right. The Chesterfield sign has replaced the "Duke of Durham" sign that once was on the face of the building. Notice that the office building is now located on the north side of Main Street. Very soon after the New Cigarette Factory was completed in 1948, the original factory building was 'decapitated'. I'm not really sure why this was done, although I've been told that it was related to costs of fire insurance. You can see in the late 1940s photo below the now two-story building to the east of the new Cigarette Factory. The building was used for storage until Liggett left Durham several years ago. It is slated to be part of the Blue Devil Ventures/Partners West Village II renovation. Evidently the BDV folks made some effort to try to rebuild the top two floors, but the National Park Service would not let them do so as part of their historic tax credit, and this idea was abandoned. The West Village folks have done a beautiful renovation of this structure, which I believe houses apartments. New cigarette factory from the interior courtyard of the old, looking west, 06.15.08. There is a pool beyond these crepe myrtles.